So, my friend Durenda was here for Thanksgiving with her family. You’ll love this more if you have an immersion blender. The one Durenda is using above didn’t survive our initial foray … so I bought this one. 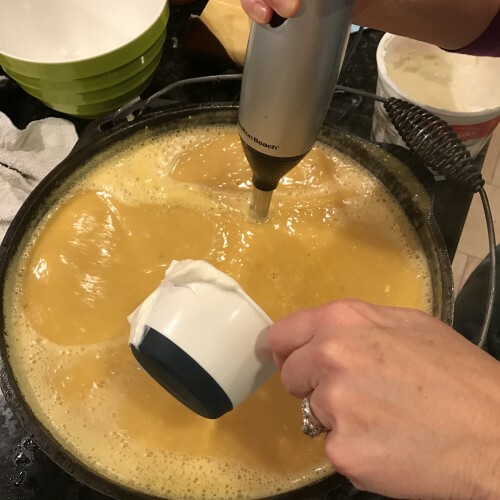 Yep—this one is better: Kitchen Aid immersion blender has a larger blade and two speeds. It’s amazing. 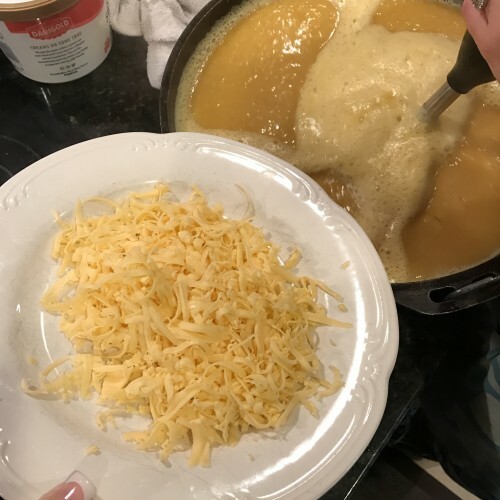 Don’t forget to top it with more cheese. Cheese makes everything better. This recipe serves eight. 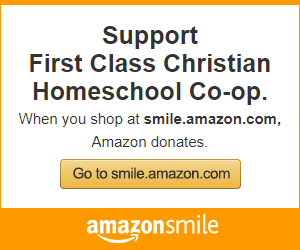 I have doubled it both times we made it — so if you’re serving a crowd, be sure to double it! Creamy, delicious and a great way to feed a crowd! Perfect for a cold winter night. In 6-qt Dutch oven, melt butter over med-high heat. 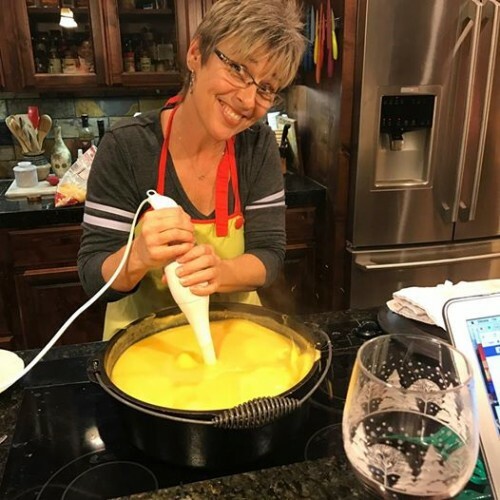 Using an immersion blender, puree while in pot. You can also puree in a blender, in smaller batches. Cover with broth and apple cider. Let it cook for about 25 minutes. It’s okay if your mouth starts watering. The chipotle peppers give it a wonderful smoky flavor and a little kick, too! Using an immersion blender, puree mixture. 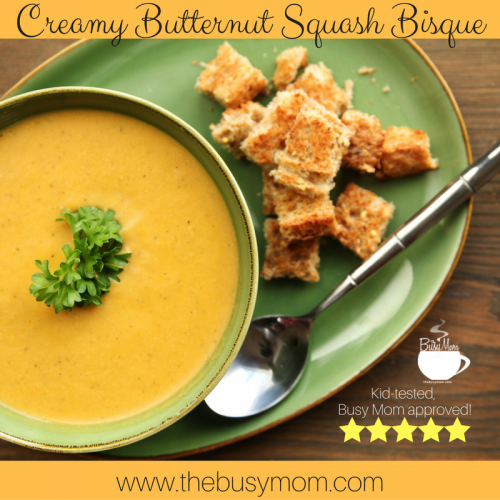 Add sour cream when bisque is smooth. 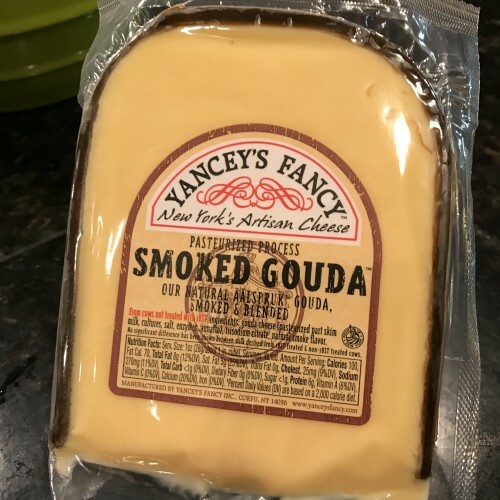 Add a bunch of smoked Gouda. Mmmmmm. You won’t be sorry if you add more. It’s that time of year again—time to snuggle in your favorite snuggling spot with a bowl of piping hot chowder and binge-watch your favorite Christmas movies. (It’s a Wonderful Life wins for me.) This is also the time of year for having kids come home and hopefully, bring a guest or two with them. You know me, I love a houseful, and this meal is a crowd-pleaser. 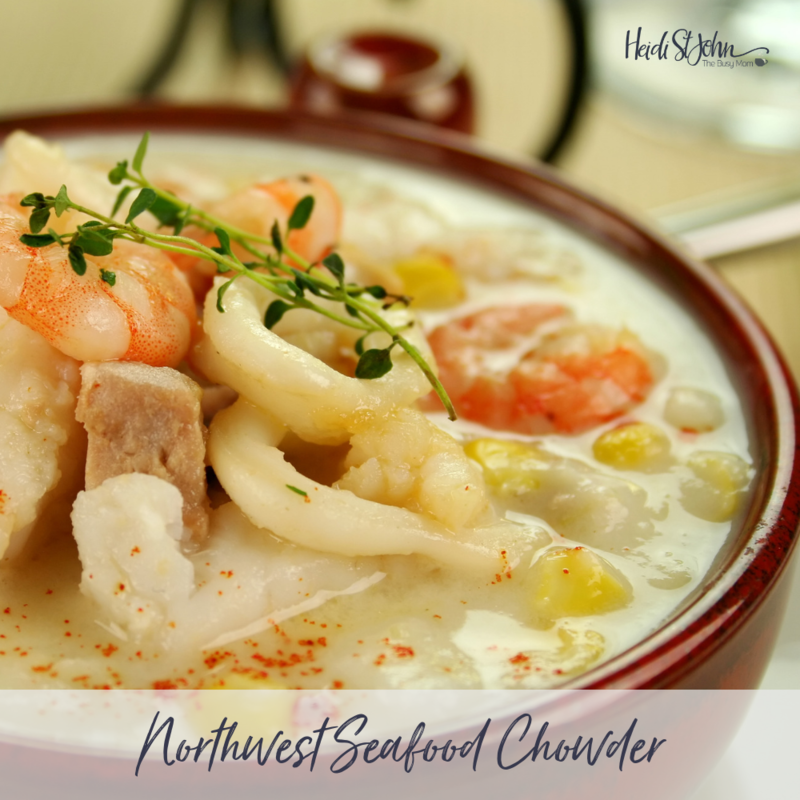 We are pacific northwest people—and as such–we like all things salmon – okay – and shrimp. Okay. We like it all. I discovered that my favorite chicken provider (hail, Zaycon!) also contracts with local fishermen for NW salmon so I decided to give it a try. It came vacuum sealed and it’s wonderful! After we knew we loved the salmon, I decided to try Zaycon cod and eventually, wild Argentine red shrimp (yum!). All this seafood comes frozen and ready to use from Zaycon. Check it out—and have wonderful seafood in your freezer all year! Give it a try and let me know what you think! My hunch is that you’re going to love it. In a large pot, saute celery, onion, red pepper and garlic in butter until the vegetables are tender. 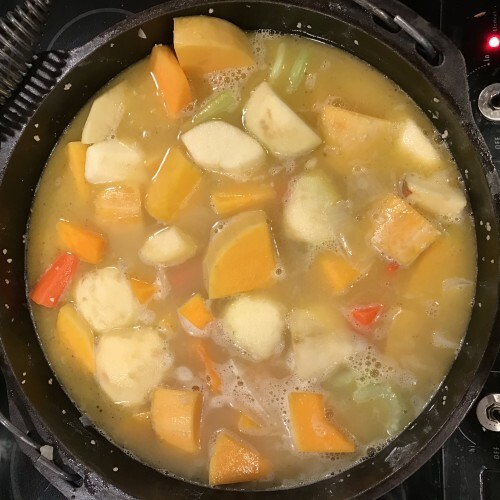 Reduce heat; cover and simmer for 40 minutes or until the vegetables are nearly tender. Stir in the corn, cream, salmon, cod and shrimp. Simmer for 15 minutes or until heated through. When you remember to invite company for Easter dinner, but forget to buy ingredients to prepare the dinner with, you know you are just slightly busy, and that’s the pickle I found myself in this year. The day before Easter was crazy, too, so after church I was scrambling to prepare food with the ingredients I had in my house. Surprisingly, a new invention was created that wound up being a family favorite. It is simple, easy to prepare, and delicious. It has a nice visual appeal, as well, and my guests loved it. They even requested the recipe, so I guess “flying by the seat of my pants” isn’t always bad. Remember that hospitality doesn’t mean you have to host in absolute perfection, and that new creations can be born out of chaos. In a large skillet, add coconut oil, and sauté the onion and garlic until translucent. In a large casserole dish, add as many chicken tenders as you need. While the chicken is cooking, whip the cream cheese until it is soft and add in salt, pepper, no salt seasoning, veggies, and some of the mozzarella cheese. Add the cream cheese mixture to the chicken tenders and mix well. 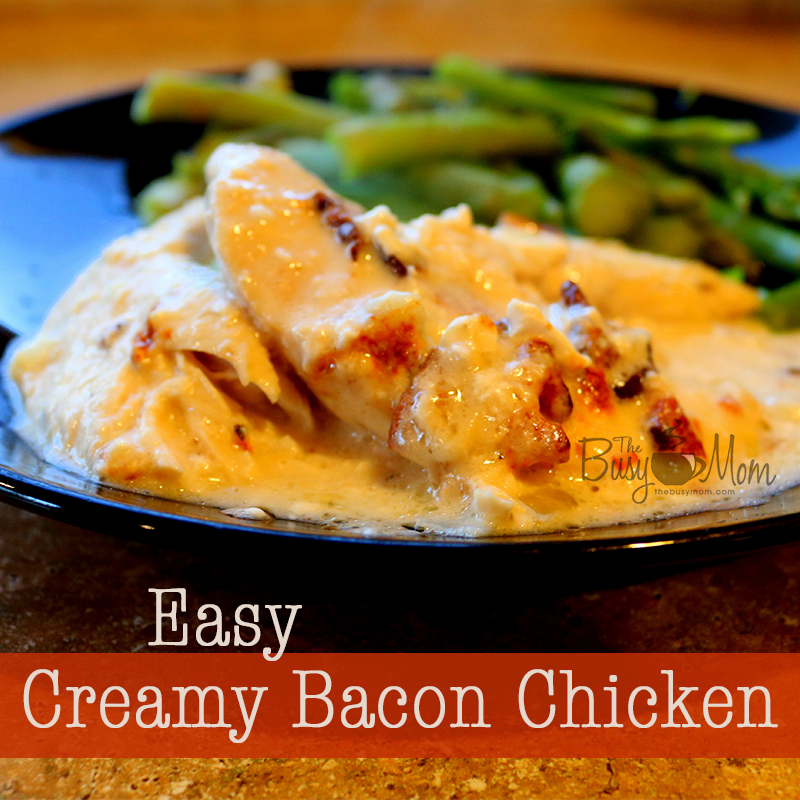 Top the chicken with a good layer of mozzarella cheese, the chopped cooked bacon, and place in oven until cheese is bubbly and brown. I remember when I was growing up, my dad used to come home from work and pull out an avocado and chips for an evening snack before dinner. I would watch him from a distance as he sliced into the avocado and began to mash it up in his bowl, making guacamole. I thought it was Soooo Gross!!! Why would he want to eat that slimy green stuff? I mean, come on Daddy, how weird can you be? 30 years later, it’s one of my favorite appetizers! I guess Daddy knew what a good thing was back then. Here in East Texas you’ll find guacamole on the menu of almost any restaurant you go to. We have an overabundance of Mexican food restaurants in Huntsville… so many that we sometimes roll our eyes when we learn someone else has opened up yet another Mexican food place. But, none of these restaurants have our favorite guacamole. The best guacamole was discovered during our annual Christmas party at our house. Our best friends showed up with their homemade guacamole that had a noticeable ingredient in it that was new to us… Garlic. Ever since then, I’ve always put garlic in my guacamole. I have modified it a bit by adding ranch dressing. 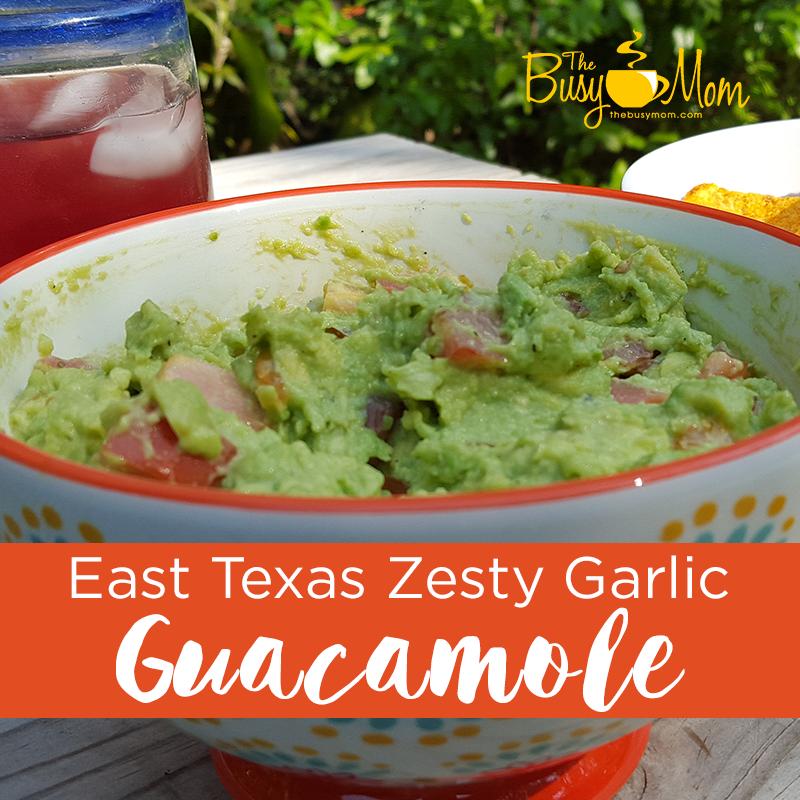 Here is my guacamole recipe that is sure to be a hit at any party! Dice your tomato and garlic cloves and set aside. Peel and pit your avocados. Then, place avocados into a medium sized bowl and dice them, gently mashing with a fork. Add juice of a lime, Ranch dressing, mayonnaise, garlic, salt, and pepper. Continue to mash and stir until desired consistency. Stir in the tomatoes and serve with your favorite tortilla chips! I love healthy, tasty, satisfying, and simple meals that are appealing to the eye. 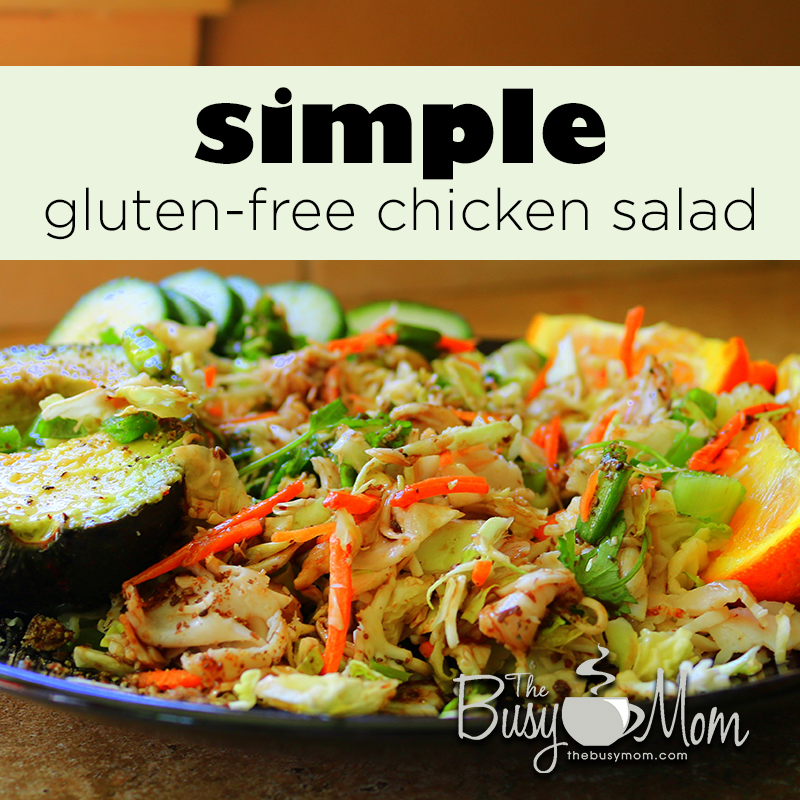 Simple is the key word here, and one of our favorite meals is an easy, gluten free chicken salad. Actually, you don’t have to use chicken. You can leave it out for a vegan meal, or you can use tuna, salmon, or lunch meat as variations. Flexible recipes are my favorite! Add grated parmesan cheese, onions, and chicken tenders and mix well. Serve on individual plates, add vinegar and oil and enjoy! 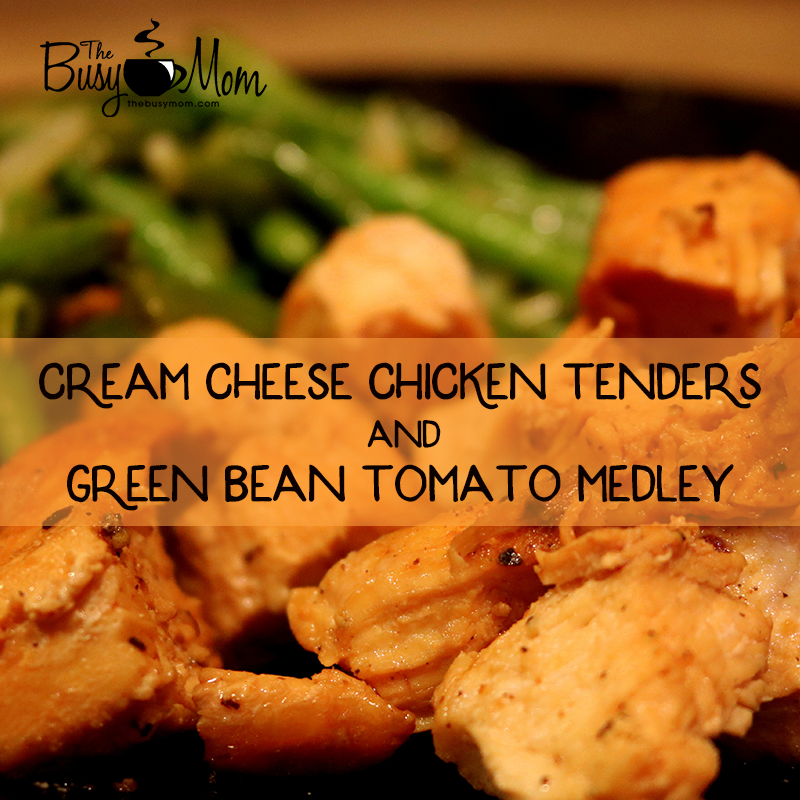 Last night I needed a super simple, healthy, gluten free meal that was quick to prepare. We were just coming down from the high time demands after talent show week for our kids. Since I direct the choir, and work with small ensembles, this kept me running with extra practices, along with other extras thrown in each day of the week. Consequently, time for planning and preparing meals was pretty much non-existent. Time didn’t allow for a trip to the store, so I began searching our cupboards, freezer, and refrigerator, and gathered some ingredients that seemed like they would compliment each other. In other words, I totally winged it! This was a cooking experience on the fly, so when my family decided they love it and want me to make it again, it was a pleasant surprise. If you need a meal that meats this criteria, you just might like this one. Season the chicken with salt, pepper, garlic powder, and no salt seasoning. When the first side is browned, flip the tenders to brown the second side, and cover. Cook until chicken is no longer pink in the middle. Add cream cheese and stir well. Add chopped onion, garlic, and seasonings and sauté until translucent. Add green beans, stir well, and cover. Cook thoroughly for about fifteen minutes, stirring from time to time, until beans are tender, but not overly soft (for frozen beans. Less for fresh). Add a handful or two of grape or cherry tomatoes and cook for a few more minutes to warm them. Breakfast is my favorite meal, and I have always loved pancakes with whipping cream and berries. Over the past four years, we have significantly changed the way we eat. 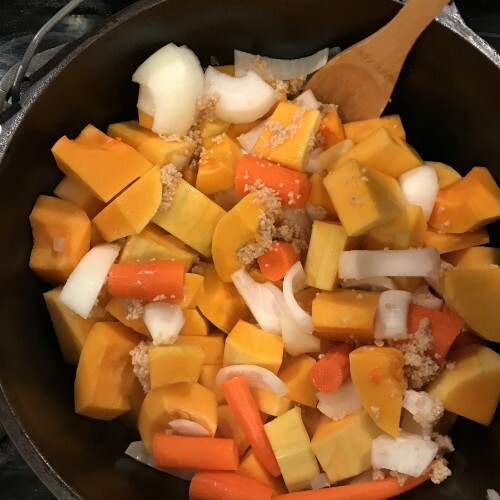 With food sensitivities in our family, and with my slow thyroid, we have to be careful to get the right foods into our diets, and avoid consuming too many carbs. When I found this recipe, I was so excited because it meant that I could enjoy a meal I had always loved, with just a little twist on the ingredients. I have added my own little flare to it because I just can’t resist playing around with recipes to make them a little more personally enjoyable. These pancakes fit the criteria for our family in every way. 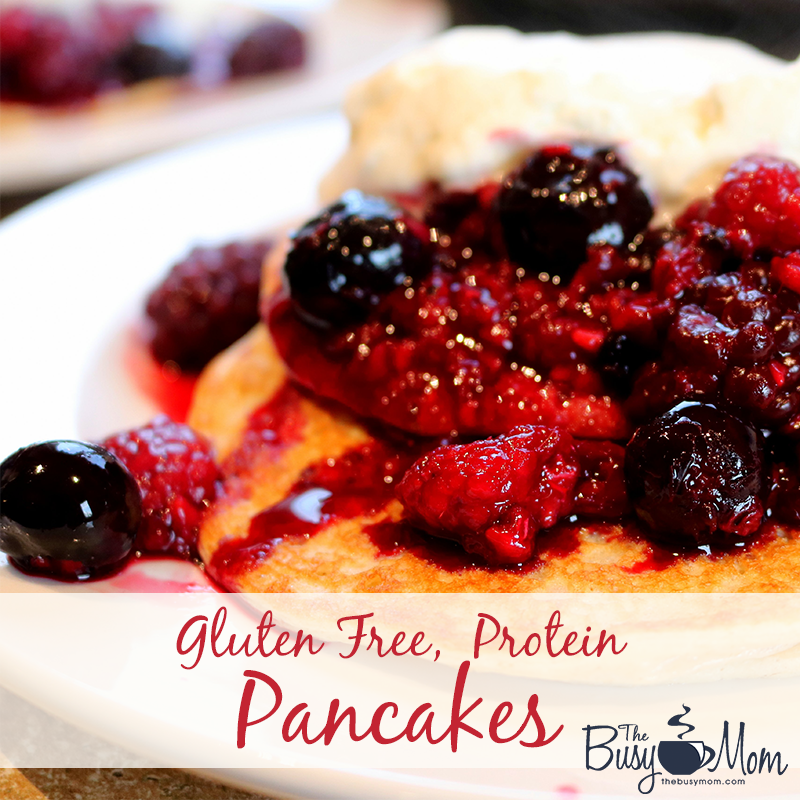 They are gluten free, they taste good, they are appealing to the eye, they are light like a crepe, they have an excellent protein to carb ratio, and they are filling and satisfying. Spray a pre-heated griddle with coconut oil spray and add medium size circles of pancake batter. Usually six to eight pancakes will fit on a griddle. When batter bubbles, it's time to flip them. After cooking on second side, remove from griddle, top with berries and whipping cream and enjoy! Remember to spray the griddle with coconut oil spray in between batches. We serve with mixed berries lightly sweetened with stevia, and we flavor the whipping cream with a dash of vanilla and stevia. For our family of seven, I triple the batch, use half of it, and refrigerate the rest for a second meal later in the week. A healthy lifestyle is an important aspect to taking care of your body. 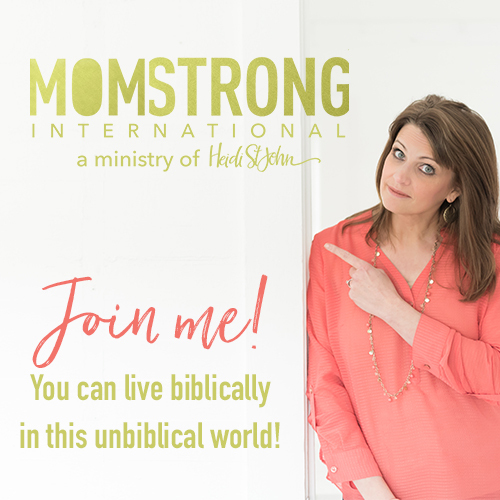 God has only given us one body to house us while we are on this earth, and it matters greatly, how we care for it. Caring for your body and feeding it well doesn’t mean you can only eat things you don’t like because they are good for you. God created food and intended it to be pleasurable as well. He is the creator of the taste bud, after all! 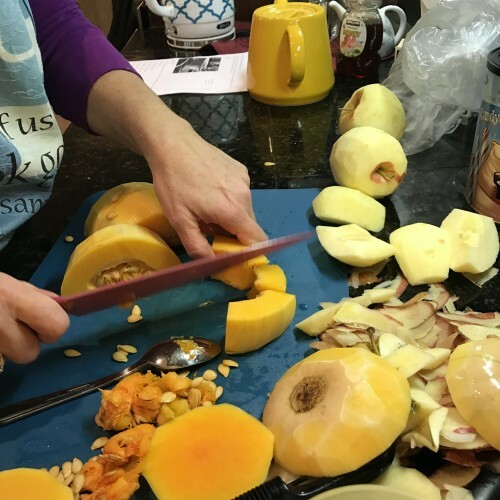 Researching new, healthy, recipes is one of my favorite past times and I have discovered many delicious new ways of preparing foods that my family loves. We don’t feel deprived because of our “limitations” due to foods we can’t eat, rather we see it a fun challenge to implement new ways to enjoy the core nutrition our bodies need for health and vitality.